Site Tracking ties your contact’s behavior on your website together with MouseClick-Campaigns so your marketing and sales processes can react and adapt in real-time to the behavior of individual contacts. If you aren’t using it, I hope this post motivates you to get it set up. There are so many useful things you can do with it. This isn’t a new feature, but it’s so powerful, with so many potential applications, I thought you might appreciate an in-depth discussion, and some specific examples, of how it can be used to improve your marketing. Get the right message to the right contact at the right time. After you install the Site Tracking code it begins collecting page view data on each visitor to your website. This data is anonymous (and inaccessible) until a visitor is identified by opting-in to your list, then all page views that have been collected up to that point are automatically attached to their contact record and subsequent page views are tracked and reported in real-time. Each of your contacts becomes a rich case study when Site Tracking page view data is combined with all the other data MouseClick-Campaigns provides — location history, Event Tracking, activities history, the contact’s social network profiles, and any tags or notes you’ve applied. Google Analytics and similar services report statistics on anonymous groups of visitors while ActiveCampaign’s Site Tracking lets you see exactly what a specific contact has (or hasn’t) done on your website. Statistics are a great way to identify trends in large volumes of data, and are popular for good reasons, but individual case studies are an underrated resource for creating detailed profiles, forming hypotheses, and examining exceptions to rules. The two approaches to data analysis complement each other giving you a more complete picture of who your target market is and how people are interacting with your website. Beyond just “good to know,” this data is actionable. Site Tracking becomes even more useful, and MouseClick-Campaigns’s unique capabilities shine when this behavioral data is used to trigger Automations. MouseClick-Campaigns can “see” what a visitor is doing and perform actions based on that behavior opening up all kinds of possibilities for marketing automation and creating a truly personalized experience. Increase a lead’s score 1 point for each page view and 2 points per visit. When their score reaches 20 points, MouseClick-Campaigns could create and assign a task then notify your salesperson it would be a good time to give the contact a call. In addition to reacting to what is happening on your website in real-time, MouseClick-Campaigns can use your contact’s page view history to further segment your lists. For instance, you might have a sale on a product that would not appeal to everyone on your list. With Site Tracking data you can send an email to only those contacts that have viewed the product (or that category of product). Or, you could send additional content on the same topic a visitor has indicated interest in while browsing your site. This kind of segmentation helps keep your list as responsive as possible and contributes to a strong, positive relationship. Your contacts will come to expect that a message from your company will contain relevant content that appeals to them — increasing your open and interaction rates while reducing unsubscribes. When sending out campaigns you can send messages to only those contacts who are tagged as interested in those products. By using “Tag is added” as the trigger to begin a new automation, you can pick up where this one leaves off. You could begin a series of follow-up messages that treats the contact slightly different depending on how they are tagged or move the contact into your automated sales process using MouseClick-Campaigns’s CRM. Create a new automation for Product 1 and select “Web page is visited” as the triggering action. Now we need MouseClick-Campaigns to divide contacts and give them the appropriate tag (or no tag). Begin by creating a condition that separates contacts who have visited 2-5 times from everyone else. I suggest 2-5 times because, in my experience, contacts who visit a page once are not necessarily interested but if they return and view a page multiple times, they likely are interested in that product for whatever reason. 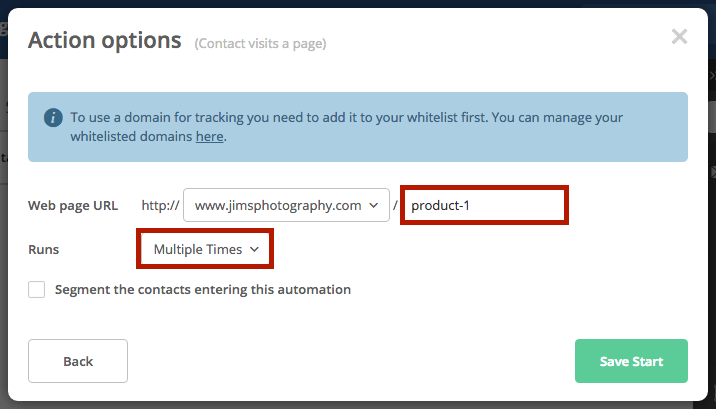 Now, to separate those contacts that have visited six or more times from all others, create an “If/Else” condition under “Conditions and workflow actions.” Select “Site and Event Data” then “Has visited.” In the field that appears enter the complete URL of the product page (in this example, “http://jimsphotography.com/product-1/”). Finally select “6-15 times” from the dropdown menu. Add an “Or” condition for any other versions of your site. Contacts will go through this automation repeatedly so they may have already been tagged as “Interested in Product 1.” Rather than having multiple tags, which might confuse things when we try to separate “interested” contacts from “very interested” contacts, let’s also create an action to remove that tag. If it isn’t on the contact when they come through, MouseClick-Campaigns will ignore this request. Be sure to end the Automation for contacts who meet the “Yes” and “No” conditions. Give the Automation a name that makes it easy to identify its purpose such as “Product 1 interest tagging” and make sure it is labeled as “Product interest tagging” so it will be easy to find when you need it. You can easily copy this Automation and change the URLs in the triggering actions and “If/Else” conditions to create Automations for each product you are tracking. You could make this Automation more effective by adding additional “And” conditions for number of visits. I left this out to keep the tutorial from becoming difficult to follow but it is reasonable to assume that a contact who visits repeatedly is more engaged and interested than one who had a spurt of page views in one session but then never returned. 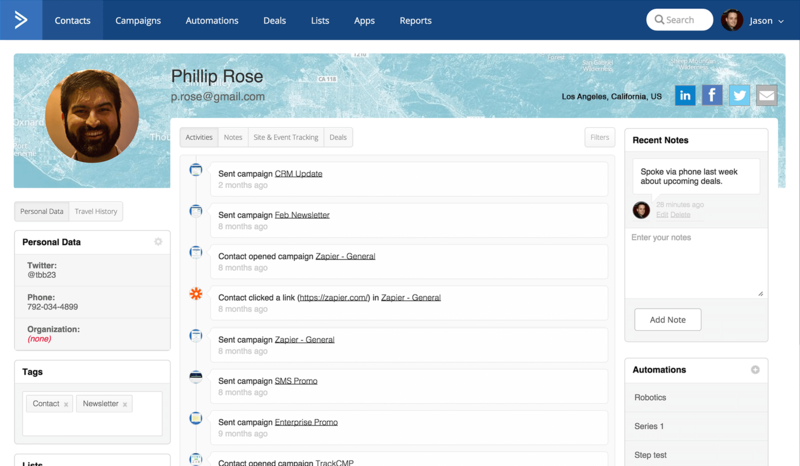 Site Tracking is an easy-to-set-up feature that bridges the gap between what contacts are doing on your website and ActiveCampaign. It helps you increase contact responsiveness by allowing you to provide carefully customized and perfectly timed messages in response to how they interact with your website. If you haven’t already, spend a few minutes to insert the Site Tracking code in your website’s header or install the WordPress plugin (which also makes it very easy to integrate forms into your site). If you have any unique or effective ways you are using Site Tracking in your business, I’d love to hear them!